You just weren’t prepared for it, were you? Your child rushed up to you with their puppy dog eyes and blurted it out. You shuddered at the mere thought. A clown. The most terrorizing being known to mankind. They wear creepy clothes, they have creepy makeup, and they’re always laughing maniacally. Transforming your child into one feels so… unsettling, but that’s their Halloween wish and sometimes, you just have to go along with it to make sure that your child has an amazing experience. If that means you have to get your child this terrifying evil jester costume, well then, that’s just what you have to do! Let’s face it. This child evil jester costume is unsettling. You know it. Your child knows it (and that’s why they want to wear it). Everyone knows it. If you’re thinking about selecting it as a Halloween costume for your child, then just prepare to feel a constant air of fear coming from your child. 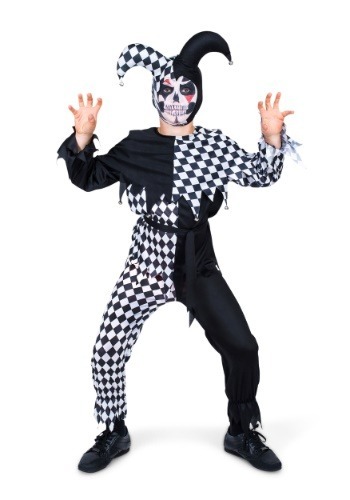 The costume itself comes with a simple top that has a white and black checkered pattern on one half and a pitch black pattern on the other side. The pants continue this look and feature an elastic band for fitting. The headpiece is an iconic jester’s cap that even has bells on each end. When your child wears this jester costume, we’re quite sure that they’ll be one happy (and creepy) clown. Just add some of our black and white makeup to your order to finish the look and you can make sure that your child looks like the most nightmarish clown in the history of clowns. And don’t worry. Once Halloween is over, you can hide the costume in a box, so your child can’t randomly where it just to give you the willies!